Time has come to revive this blog, and it’s now on WordPress with a bit of help from Ian at the Logic Studio. Thank you very much, Mauricio, for hosting it at Geekzone for ages. Been a while since I used WordPress and there are lots of things to go through as well as features to tweak (suggestions and bug reports are always welcome), but am liking it so far. I will like WordPress and the Publisher theme better when I figure out how to customise things to my liking. Apologies in advance for breakage and ugliness. I’ll be writing mostly about gear and software here, and thought I’d start with the Lenovo ThinkPad X1. Lenovo has some very cool X1 family designs. The X1 Tablet-PC crossover is no exception. It’s well-built, has the kickstand-style support that I still think is the best stand for these type of machines, and a good sized full keyboard that’s great to type on. There’s also the trademark red “J” mouse button, a big trackpad with two clickers that’s accurate and good to use. The 13-inch 3000 by 2000 pixel IPS screen is excellent and easy to read outdoors and it’s touch-enabled too. I got a Wacom pen to draw on the screen with, and there’s a fingerprint scanner and a 720p webcam and an 8Mpixel rear imager. Two Thunderbolt 3 Gen 3 ports, a micro-SD card slot and a combo audio/microphone port can be found on the sides of the X1 Tablet. My X1 Tablet sample came with an Intel i5-8250U processor with a six megabyte cache, four cores and eight threads. It runs at 1.6 GHz and can turbo up to 3.4GHz. The whole X1 Tablet package is fairly light at 890g on its own, and 1.27kg with the keyboard attached. Very portable really – for a laptop. As a tablet, it’s on the big side, like Apple’s 12.9-inch iPad Pro. 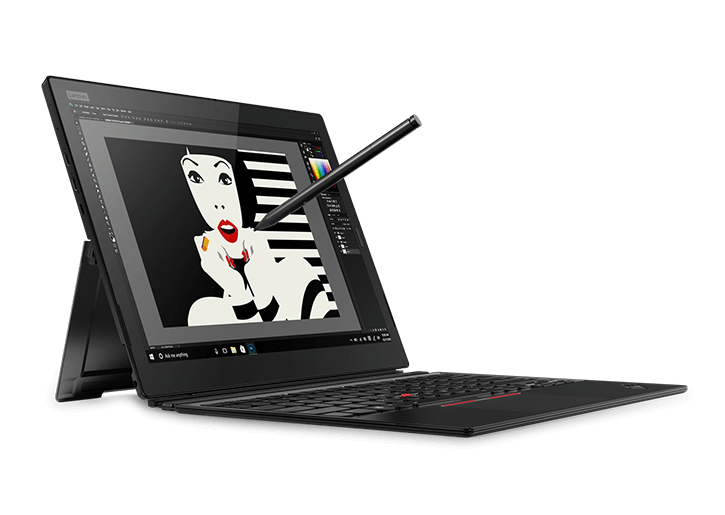 With 8GB of 2133MHz LP-DDR3 memory and a 256GB SSD and the Active Pen, the X1 Tablet costs $3,400 including GST according to Lenovo’s website. Good looks don’t come cheap, in other words. Design misses? Well, the power button in the corner is reallllly little and hard to use. This being an Intel CPU machine, there’s a fan inside (NPI) and the hot air exhaust is by the power button. It warms up that bit of the X1 Tablet and the top of the Active Pen. I got as far as typing a bit on the keyboard using the Windows 10 built-in apps, trying out the Active Pen and then the updates arrived. Windows 10 is very insistent with updates so I clicked yes, restarted, oh, another restart needed and look, two Lenovo recommended updates? Better apply those as well. One was for the X1 Tablet BIOS, the piece of code that starts up PCs and manages the hardware on them (yes it did actually say a BIOS updated). That installed without a hitch, with a 90s-style VGA resolution text-based progress indicator and everything. The firmware update for the SSD storage device controller was next, and the installer said everything went well, but it wasn’t telling the truth. When I restarted the X1 Tablet it didn’t get further than the Lenovo splash screen and eventually displayed an error message about the SSD having a fault (in tiny tiny letters on the 3K screen). Sad. My machine had been out to other people and probably led a tough life which might have contributed to the SSD giving up the ghost. 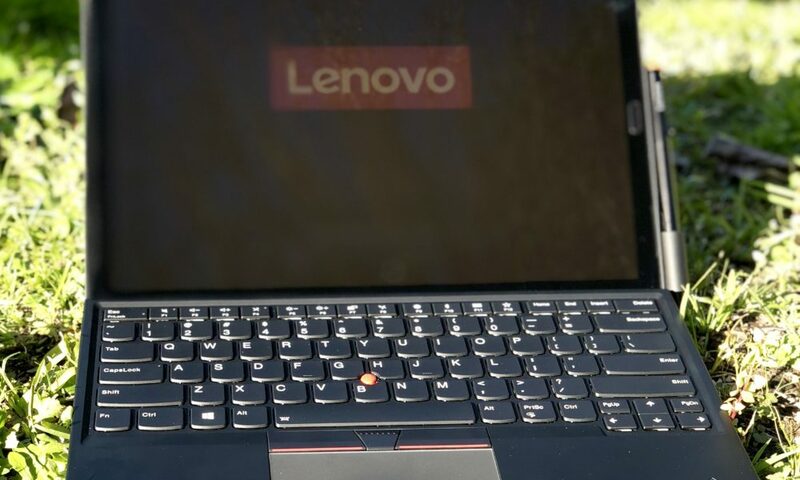 Will be returning the X1 Tablet to Lenovo for further investigation, and hope to continue this review soon with a repaired machine and run some benchmarks and check out the battery life and more. I get techie and write about it after. Mainly for the NZ Herald and itnews.com.au. Content Copyright © Juha Saarinen. If you wish to use the content of my blog on your site, please contact me for details. I’m usually happy to share my material as long as it’s not for spamblogs and content farms. Please attribute with a link back to this blog. If you wish to advertise on my blog, please drop me an email to discuss the details. Comments policy All comments posted on this blog are the copyright and responsibility of the submitters in question. Comments commercial and promotional in nature are not allowed. Please ensure that your comments are on topic and refrain from making personal remarks.